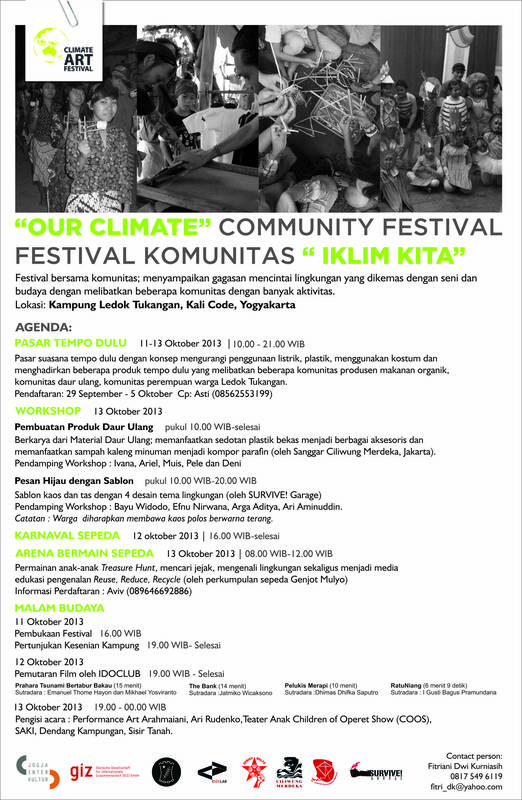 Festival bersama komunitas; menyampaikan gagasan mencintai lingkungan yang dikemas dengan seni dan budaya dengan melibatkan beberapa komunitas dengan menghadirkan banyak aktivitas. Berkarya dari Material Daur Ulang; memanfaatkan sedotan plastik bekas menjadi berbagai aksesoris dan memanfaatkan sampah kaleng minuman menjadi kompor parafin(oleh Sanggar Ciliwung Merdeka, Jakarta). Pendamping workshop : Bayu Widodo, Efnu Nirwana, Arga Aditya, Ari Aminuddin. Catatan : Warga diharapkan membawa kaos polos berwarna terang. 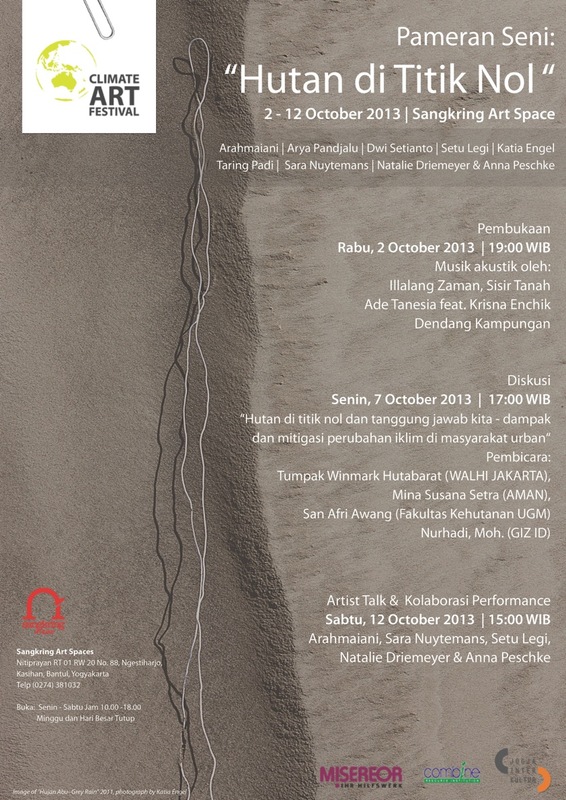 Pengisi acara : Performance Art Arahmaiani, Ari Rudenko, Children of Operet Show (COOS), Menik Sithik, Octo Noor Arafat, Sanggar Cirakaka, Teater Koin, Teater Kebon Teboe, Mishbah, Gorong-gorong, Komunitas Nagata, Kampung 14, Sanggar Anak Kampung Indonesia (SAKI), Dendang Kampungan, Sisir Tanah. Oleh “Kelompok Acak Murah” (nama band dari hasil musik workshop terdiri dari musisi: Tommy Simatupang, Sebastian Maschat, Wukir Suryadi, Merry Sajuto, Akbar Wicaksono (basist), Eko Susilo, Asri Pradipta, Akbar dan Thambun Sape). Presentasi kan mencakup komposisi, improvisasi dan demonstrasi hasil eksperimen, Durasi tergantung proses workshop, sekitar 75-90 menit. Tema-tema yang akan diangkat adalah di antara yg lainnya: Efek rumah kaca, Kebakaran hutan, Lalu lintas dan pesan ke luar negeri. Seniman: Arahmaiani, Arya Panjalu, Dwi Setianto, Setu Legi, Katia Engel, Taring Padi, Sara Nuytemans, Natalie Driemeyer & Anna Peschke. Moderator : Bambang Muryanto Bagus Kusuma Adji (The Jakarta Post). Sandiwara Alam – sebuah perjalanan untuk merasakan secara langsung pengalaman dan pemahaman masyarakat setempat, yang membawa potensi untuk perubahan global. A journey to lived experiences and indigenous knowledge, which carries the potential for global change. Dari 100 Film bertema perubahan iklim, departemen film Goethe-Institut Pusat dan ECOMOVE International memilih 6 film panjang dan 7 film pendek. 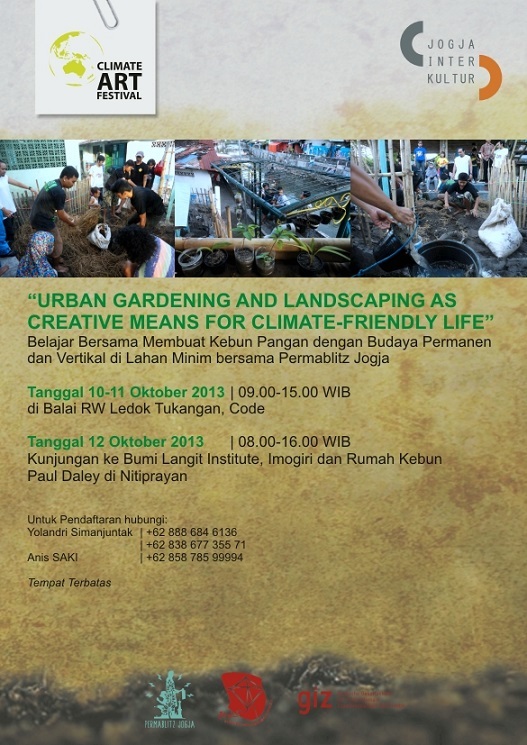 V. WORKSHOP : ” URBAN GARDENING AND LANDSCAPING AS CREATIVE MEANS FOR CLIMATE-FRIENDLY LIFE”. Membuat Accessories dari Recycle Material (Comunitas Ciliwung Merdeka, Jakarta). Providing free shopping bags during the festival and waste bin in festival location, Mural for Public awareness. Tema Karya mengolah pesan betapa pentingnya Pohon dalam kehidupan dan aktivitas kita. Ismu (Kill Jim), Zent, Digie Sigit, Guerillas, Antitank, Rolly love hate love, Bayu Widodo, Adit here here, Methodos, Isrol Media Legal. di Alun-alun Selatan Yogyakarta, Short Brief. The participant submitting the photograph as end of this rally. Category: amateur & professional with no age limit. Transportation route by location to another location had to be travel by bicycle. From Oct 14 – Oct 28, 2013. 3-position of best photography winner will be announce at the opening of rally photography exhibition. This Photography exhibition is the result of selection of participants rally photos. In this exhibition, only the best 30 photos will be selected in accordance with the jury assessment criteria. At the opening ceremony of the exhibition was also as a result of the announcement of the winner and award 3 photos Rally photo works best. Media coverage in the mass media will be more extensive. As biggest archipelago in the world, Indonesia is especially exposed to consequences of climate change. The Indonesian government has indeed signed all important international agreements on actions to fight the climate change, but the associated measures have yet to reach most of the population. The country is classified as third biggest greenhouse gas producer in the world – primarily because of the rapid destruction of its rainforests. The resulting changes of climatic conditions hardest hit the farmers who lose their traditional livelihood or experience man-made natural disasters, as well as fishermen who are confronted with unusual alterations of the sea and maritime life. Soon however, the urban population and industries will also more and more face the results of climate change, namely rising temperatures and pollution in metropolitan areas and increasing problems with energy supply. Therefore – beside political decisions – there is a big need of practical ideas, how common people can deal with these problems in their daily life and change their habits accordingly. While waste separation, energy saving and organic farming are already common routines in Western countries, many Indonesian never heard of those topics. As one of the richest industrial countries, Germany bears a historical responsibility for global carbon emissions. In the course of the growing ecological awareness the German government assumes this responsibility by supporting developing countries in their measure to protect the climate today. Also in its priority partnership with Indonesia climate change is one of the core issues in the German development cooperation, especially focusing on “Nature and Climate Protection”, “City Traffic Emission Reduction” and “Forest and Climate Protection”. 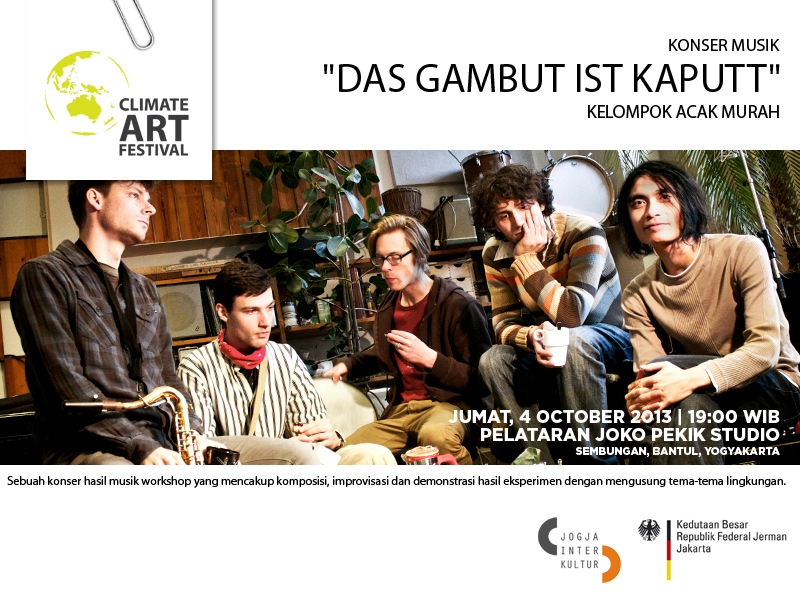 The Climate Art Festival wants to transfer this German-Indonesian cooperation from a political-scientific level to a cultural level. Art, Music and Performance are media, which are able to reach a broader public and to open new possibilities to communicate the subject with people without special expertise on the topic. Workshops can initiate concrete projects that could be continued after the festival and give examples for others in a sustainable way. The target is to show that even small communities can actively act against climate change and environmental destruction: by using alternative energies, collective waste management or the re-design of public spaces. Regarding the necessary knowledge transfer, intercultural understanding and social networking play a crucial role in this matter. The idea for the Climate Art Festival emerged during some brainstorming on intercultural projects that could convey the global need for action concerning environmental problems to a local public. An all-women-group of German and Indonesian artists and cultural workers, journalists and environmental activists put the program piece by piece together. Jogjakarta as Indonesia’s most important cultural metropolis and biggest student city in mid of a traditional rural surrounding seemed to be predestined as location for this event. Local galleries, studios and artist and activist groups responded well to the idea and thanks to the financial support of the German Embassy to Indonesia, the German Development Cooperation (GIZ), the Goethe-Institut Indonesien and the aid organisation Misereor, the Climate Art Festival could be realized.